Since its establishment in 1968, SDS Biotech has been engaged as a research and development-oriented agrochemicals company in the development of products with superior effects, high levels of safety, and environment-friendly properties. Our active substances have been in consistent use in a wide range of agricultural fields, from paddy rice to fruit trees and vegetables, and have become indispensable items. Looking ahead, with the aim of further strengthening and expanding our range of proprietary active substances, we are committed to continuing to support agriculture in Japan and overseas through our integrated operations in the agricultural chemicals business extending from research and development to manufacture and sales. Agricultural chemical products are produced by manufacturing the active substance, adding to it auxiliary ingredients, then undertaking processing and formulation to render the product practically usable in paddies and fields. The product is then delivered to market through dedicated distributors. 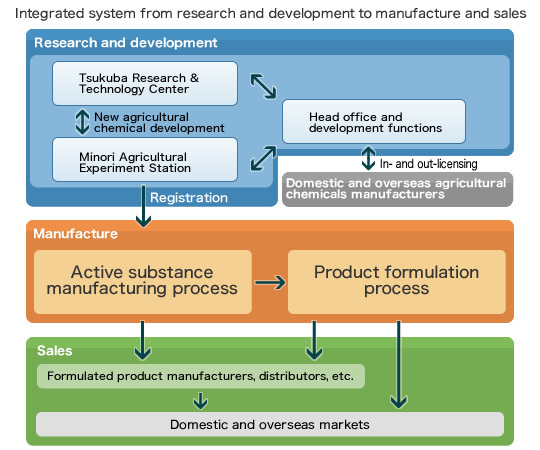 As an active substance manufacturer whose essential business is in the research and development, manufacture, and sales of active substances, SDS Biotech carries on research and development of new agricultural chemicals at Tsukuba Research & Technology Center and Minori Agricultural Experiment Station. This research and development system has produced major achievements including the development of the paddy herbicides Daimuron and Benzobicyclon. We have also strengthened and expanded our range of proprietary active substances by in-licensing substances from other companies, including the paddy herbicides Cafenstrole and Thenylchlor and the seed disinfectant Pefurazoate. Meanwhile, in the case of one of our core products, the fruit tree and vegetable fungicide Daconil, we undertake not only development and manufacture of the active substance but also of finished products. 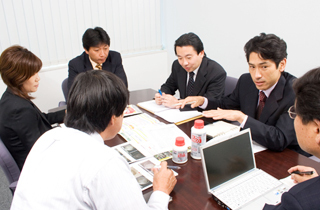 The solid sales performance of Daconil in the Japan, Asia, and Oceania regions over a period of many years has enabled us to establish strong relationships with distributors. SDS Biotech is thus a highly distinctive manufacturer of agricultural chemicals operating an integrated system of research and development, manufacture, and sales that covers not only active substances but also finished products. Taking advantage of this distinguishing feature, we aim to achieve stable and sustained growth going forward. 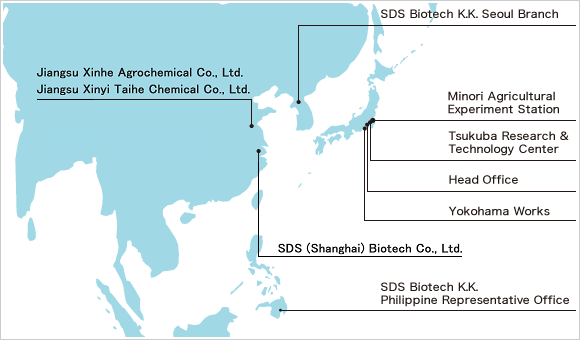 Based on the relationship of trust built up over many years with domestic and overseas distributors in the marketing of Daconil, SDS Biotech has rolled out a global sales system centered on the Asia and Oceania regions. In recent years, we have also in-licensed agricultural chemicals from overseas and undertaken their development and sale in the domestic market, thus implementing 2-way global development: from Japan to the world and from the world to Japan. In addition to domestic sales & marketing division, we maintain two overseas bases and have rolled out a system capability of responding accurately and speedily to the very varied requirements issued by distributors and agricultural operators. These sales bases also function as centers to gather market information from the relevant region and serve a useful role in allowing us to implement research and development responsive to market needs. We have also utilized our global sales system in the development field to conduct in-licensing of overseas products to Japan. Among the new active substances we have so far introduced in this way are biological products, insecticides, and plant growth regulators, which have reinforced our product platform. This illustrates that our sales activity is not limited to the usual one-way flow of sales from Japan to the world, but represents a 2-way sales strategy with products also flowing from the world to Japan.